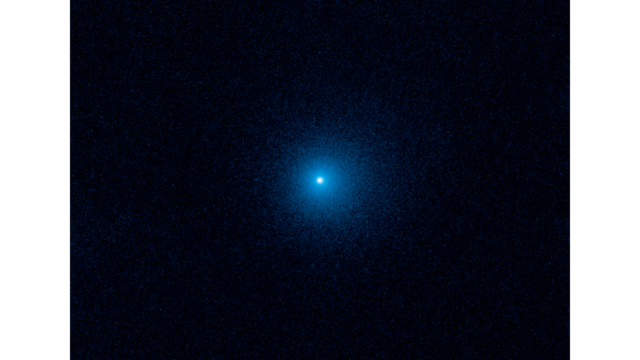 September 28, 2017 – NASA’s Hubble Space Telescope has photographed the farthest active inbound comet ever seen, at a whopping distance of 1.5 billion miles from the Sun (beyond Saturn’s orbit). Slightly warmed by the remote Sun, it has already begun to develop an 80,000-mile-wide fuzzy cloud of dust, called a coma, enveloping a tiny, solid nucleus of frozen gas and dust. These observations represent the earliest signs of activity ever seen from a comet entering the solar system’s planetary zone for the first time. Jewitt said that NASA’s James Webb Space Telescope, an infrared observatory scheduled to launch in 2019, could measure the heat from the nucleus, which would give astronomers a more accurate estimate of its size. Wide Field Camera 3 was built by Ball Aerospace in Boulder, Colorado. It’s one of five instruments currently operating on Hubble that were all built by Ball Aerospace.